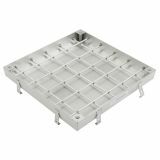 Drain covers, also known as manhole covers, come in load-bearing classes so you can be sure that they’re going to perform under the strain of weight from cars, trucks and airplanes. 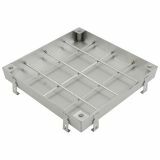 The weight classes are slightly different from channel drains but our simple manhole cover sizes guide with weight loads and applications can be found here. 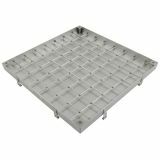 Cast iron manhole covers reach a higher loading class than galvanised steel manhole covers as the stronger material allows them to be classified for higher weight loads. 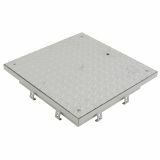 For example, an F900 class cast iron manhole cover weighs 145kg itself and is certified to hold up to 90 tonnes of weight. 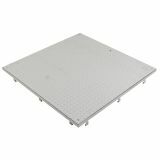 An A15 class cast iron manhole cover is certified to hold just 1.5 tonnes of weight, pedestrian and cyclist traffic only. 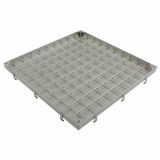 Cast iron drain covers are a favourite with most installers as the strong, durable material they’re manufactured from gives them an extra piece of mind that these drain covers will be long-lasting. These manhole covers are also black in colour, whereas galvanised steel is a metallic silver finish, so the cast iron in E600 load class is perfect for highways where the manhole cover can blend into the tarmac for a better aesthetic. Galvanised steel manhole covers are to be used in areas with slow-moving traffic or with only foot traffic as they’re not suitable for highways or roads. Even in car parks it’s advisable to avoid galvanised steel manhole covers as they can be slippery in wet and icy conditions. Galvanised steel manhole covers often have a chequered design too to minimise risk of slipping to pedestrians and slow-moving vehicles. Recessed manhole covers are a way to keep access to a drainage system in an area where design and aesthetics might be of higher priority. 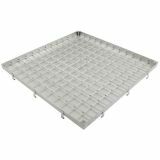 Recessed covers feature an indented metal tray, available in various depths, that provide a base for paving slabs, block paving or screed to be laid in. Once the manhole cover has been installed in place you can lay the paving or screed and leave it to set/dry. Perfect for pedestrian areas where architectural design may be carefully curated, recessed manhole covers give access whilst blending in with surroundings. Whether you’re lifting a small drain cover or a larger, cast iron drain cover you can use manhole lifting keys or professional lifting machines to ensure you’re removing the cover as safely as possible. Keys are better for smaller, lighter weight manhole covers. They’re available in different handle styles to give you more choice on what you find most comfortable and most secure. 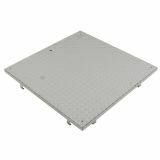 For heavier duty drain covers you can purchase a foot lever to lift the cover or professional lifting machines from Monument. These lifting machines allow one person to safely lift a square, rectangular, circular, triangular or split cover within a minute. Made in Britain, Monument have designed this product to fit easily into a standard car boot, perfect for small local contractors right the way up to large national contractors. It could seem like a small issue to you if you spot a small crack in a manhole cover or drain cover but now is the time to be realistic. This crack is dangerously compromising the strength of the manhole cover to the point where even a small child stepping on this could fall through. Whenever you spot a structural issue with a manhole cover, replace it. Unfortunately, if there’s damage to a manhole cover then it’s prudent to replace the frame too as there’s no clear-cut way to ensure the frame is sound. All you need in any situation (except if you discover a plastic inspection chamber) is the clear opening measurement. This is the width, height and depth of the inside of the frame the manhole cover is sat in. Every manhole cover is measured the same so once you have this, you’re able to find a replacement. 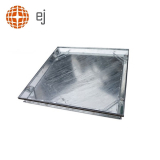 Does your manhole cover have an inspection chamber underneath it? If it does, then you’ll need to measure the diameter of the circular chamber (these chambers are almost always covered with a circular manhole cover) and pick a manhole cover and frame which matches this. 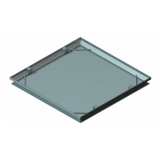 Double-check that the cover and frame you choose is compatible with all major inspection chamber brands, and make sure it’s still the correct load class. As explained in our guide to manhole load classes, each of the classes denotes the maximum weight that the manhole can safely take. For example, if the manhole cover is going to be installed in a private driveway, you could safely assume B125 would be a high enough load capacity. 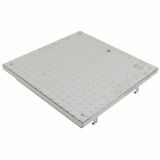 This allows for up to 12.5 tonnes of loading which should satisfy 4x4s and vans on a domestic driveway. It’s at your discretion to decide what you need, but our advisers give recommendations daily so it’s worth asking. It’s a good idea to consider things like food shopping delivery vans and lorries using your driveway to turn.